We’ve devoted this first issue of Fray to busted stories. It’s moments like these that teach us who we are, and steer us toward who we’ll become. Maybe the kid who gets busted for shoplifting won’t grow up to be a bank robber. Maybe the guy who gets drunk at a wine tasting won’t become an alcoholic. Maybe the kid who gets busted for changing his report card will grow up to become extra sincere. 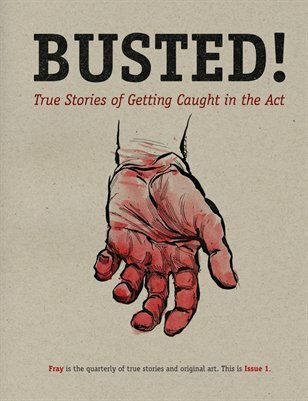 Busted stories are about good intentions, social expectations, and a sense of propriety that gets challenged. Sometimes we bust ourselves, sometimes getting busted is just something funny that happened once, and sometimes it’s hard to tell who should be busted. What defines us is what we do after we’re busted.